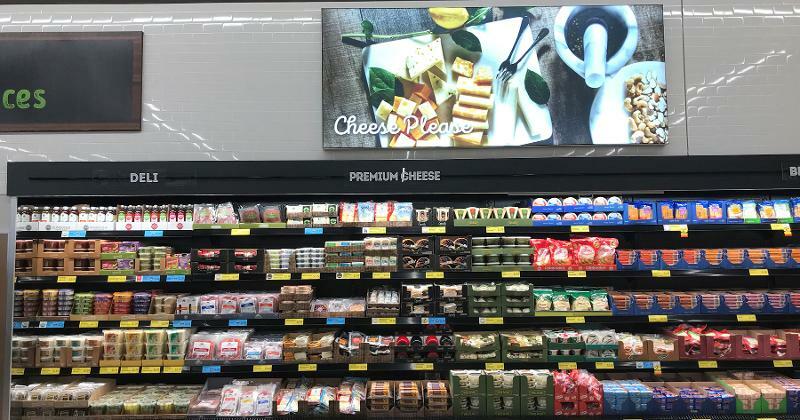 In the midst of an accelerated growth initiative, Aldi recently debuted its newly remodeled store in St. Charles, Ill., featuring a larger format with expanded fresh offerings. 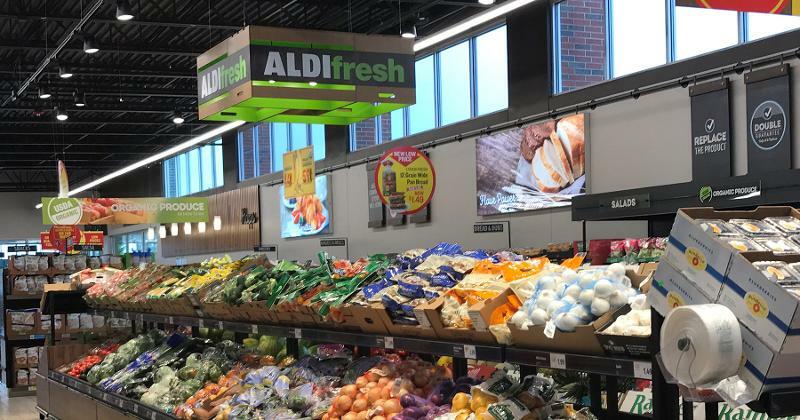 The store serves as a representation of what to expect from a new generation of Aldi stores, according to company execs, as the retailer is investing $5.3 billion to remodel existing locations and increase its U.S. footprint to 2,500 stores by the end of 2022. The 12,000-square-foot St. Charles location has just five aisles, but it is 20% larger than its earlier-generation format, featuring expanded produce, refrigerated and frozen foods sections. 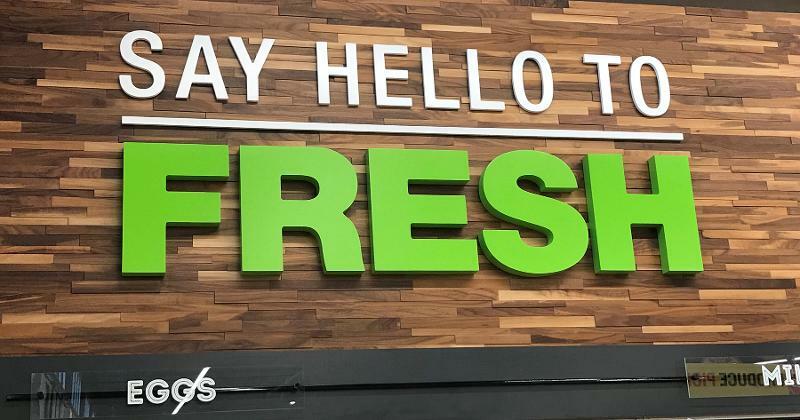 With an emphasis on fresh, organic and easy-to-prepare options, 20% of products in every remodeled Aldi store will be new compared to last year, the company said. 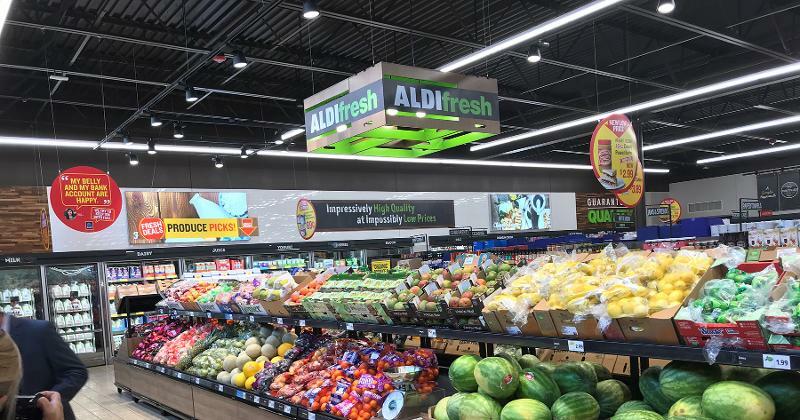 Aldi execs said they have already expanded fresh food offerings by 40%, with new items including veggie noodles and ready-to-eat sliced fruits such as mango, pineapple and watermelon spears, as well as additional organic items. The department also features a “Produce Picks” section, offering a limited number of items at steep discounts. Unlike most grocers who feature the produce department at the front of the store to impart freshness, the produce section in Aldi’s remodels is located in the back of the store. Scott Patton, VP of corporate buying for Aldi, said the retailer’s produce section is growing twice as fast as any other category in the store. 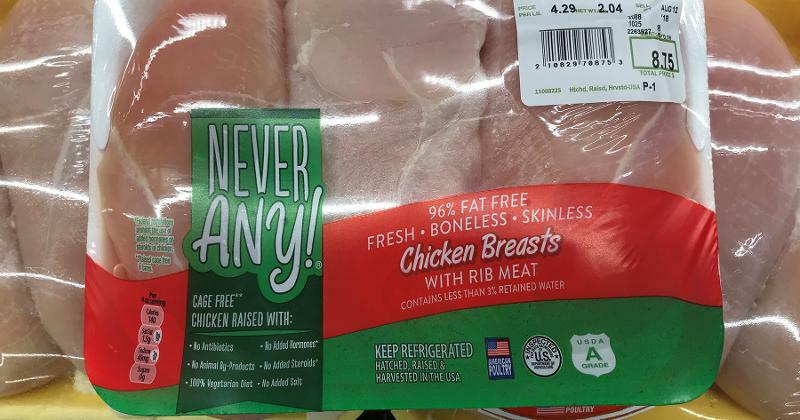 The new-format store also emphasizes ready-to-cook and organic fresh meats, including organic chicken breasts and marinated cilantro lime chicken breasts. The retailer’s Never Any! line features meat products made without antibiotics, added hormones, animal byproducts, steroids or salt, and is made from animals that are fed a 100% vegetarian diet. The line recently earned the Good Housekeeping Seal. Aldi’s expanded Earth Grown line now features new vegan and vegetarian options, including kale and quinoa crunch burgers, as well as chickenless patties and tenders. Store remodels will also include expanded baked goods offerings, such as white and whole wheat pita breads, sourdough loaves and gluten-free bagels, as well as deli items such as fresh organic salsa, antipasti salad, gourmet olives and calzones. 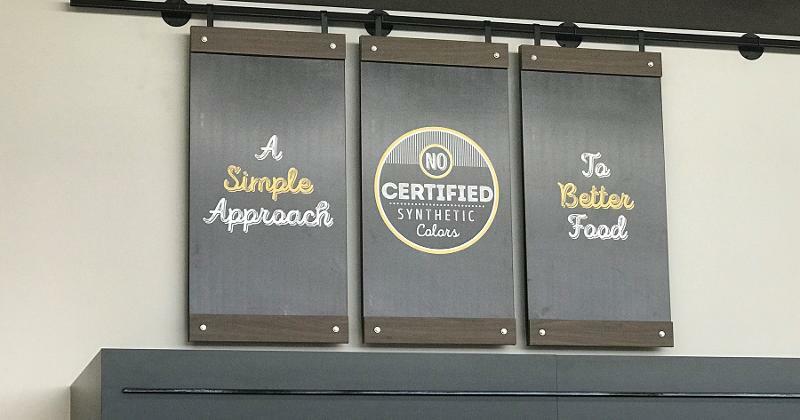 The St. Charles store’s expanded refrigeration offerings appeal to grab-and-go convenience with items such as single-serve guacamole and organic hummus, plus fresh fruit and vegetable snack packs. 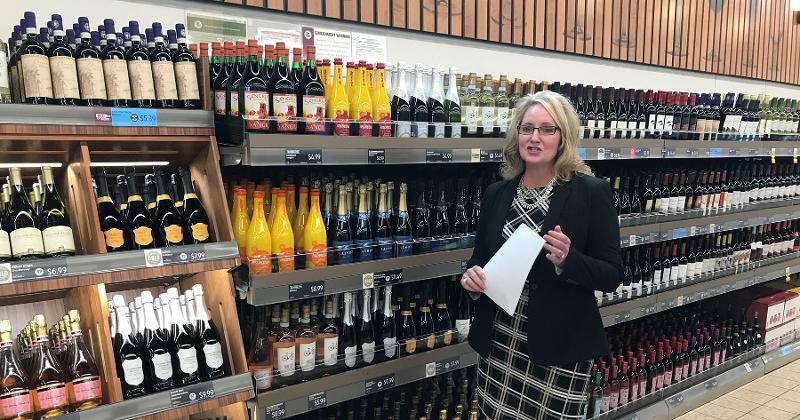 New beverages include strawberry kefir and kombucha, as well as the addition of organic almond milk, coconut milk and a full range of lactose-free soy milk, making Aldi one of the largest providers of private-label milk alternatives. The retailer has also expanded its selection of easy-to-prepare meal starters, featuring quinoa bowls, premium pasta sauces and vegetarian options, such as meatless hot dogs and sausages. Aldi’s assortment features about 90% of its exclusive brands, including its award-winning wines. The retailer has received more than 300 product awards for its wines, cheeses and private label lines. Also new is “Aldi Finds,” featuring 30-50 seasonal foods and beverages that are available over a weeklong period. The retailer carries another 30-50 household and nonfood products, such as carpets and drawers for student dorm rooms. With all the upgrades and product expansions, Aldi execs say the company’s mission is to “keep it simple.” Product assortment is tailored to not overwhelm shoppers with too many choices, and the simple store format is designed to make the shopping experience enjoyable and easy to navigate. "The continued success of our store expansion and remodel initiatives has given us the opportunity to carefully select and introduce new products that satisfy our customers' increasing preferences for fresh items, including organic meats, salad bowls, sliced fruits and gourmet cheeses," Jason Hart, CEO of Aldi U.S., said in a statement. "We know people lead busy lives, so we're making it even easier for them to purchase everything on their shopping list at Aldi, while still saving money."